It’s the time of year when, if you haven’t already had it, you should be thinking about getting the annual flu vaccination. It is just one of the ways to make sure we stay well during the winter months. For some people it’s something they do every year without fail. As we’re regularly coming into contact with service users, we encourage our staff to get vaccinated to make sure they’re protected, as well as their families and work colleagues. When you think about it, we are all coming into contact with people, whether in the shops, on the bus or train, or just walking down the street. The flu virus is highly contagious and it’s largely preventable with a vaccination that is generally available from GP practices and high street or supermarket pharmacies. So why would you put yourself at risk of picking up the virus when it’s so easily prevented? Well, one colleague told me that she wouldn’t get a flu jab because the last time she did she suffered the worst flu she’d ever had just afterwards, and she blamed the vaccination. There are reasons why this happened but it most definitely was not because of the flu jab. I started to think about the type of questions I’ve been asked over the years which could put people off getting a flu jab. If you’re in two minds about getting vaccinated this year, take a look at the answers and maybe you’ll think again and minimise your risk of getting flu this winter. I’ve never had flu so why should I need a flu jab? If you’ve never had the flu or any flu-like symptoms then you are very lucky indeed, and actually I might be a tad jealous. That said, flu is caused by several viruses and these can change each year so there is no guarantee that you will always avoid picking up one of them. I would still encourage you to consider getting vaccinated. Can I have a flu jab if I’m pregnant? Yes. There is no risk if you are pregnant, or if you’re breast feeding – providing you have no egg allergy (if you do then mention this to your GP). The protection from the vaccination lasts for a few months after birth. Can my children be vaccinated? Yes although it’s offered as a yearly nasal spray. For eligible children (dependent on age, location and health conditions) it is available free on the NHS – although this will eventually be rolled out to include older children. As children can be prone to illness and are perhaps not as hygiene aware as adults, having the flu vaccine may be worth considering so talk to your GP about it. Can I take antibiotics if I get the flu? As the flu is caused by a virus and not bacteria, taking antibiotics is not recommended - unless you have picked up a bacterial infection, in which case, antibiotics may be necessary. This is the same for any coughs, colds and sore throats. To avoid picking up the virus, think about reducing the risks of cross contamination – make sure you wash your hands regularly especially after being in public places (shopping trolley handles are full of bugs) and use cleaning wipes if using any shared resources such as a computer screen or telephone at work. Can I get the flu jab for free? Yes if you are eligible it is available free from the NHS. Those aged 65 or over, pregnant women and children aged 6 months to two years and adults over the age of 18 who are at risk of flu (due to weakened immune systems or with underlying health conditions, particularly long-term heart or respiratory disease). If you’re unsure, check with your GP. For those who are not eligible, the cost varies but is around £10, not much more than the cost of a prescription. Is it too late to get the flu jab? The new vaccine becomes available around September each year as the season runs from October to May. The best time to get vaccinated is between September and November, but as most cases of flu are reported from late December to March, there’s still time to get vaccinated. Why do some people get the flu after they’ve been vaccinated? The flu jab has no active viruses in the vaccine and as such cannot cause flu. It’s possible that some people have flu-like symptoms or they may have caught the flu before the vaccination had taken effect, which can be between 10 and 14 days. There are several strains of flu virus so there could also be a possibility that some people are infected by one that isn’t included in the vaccine for that year. Will it stop me from getting a cold? No, the flu vaccine only protects against the flu, so you could still catch a cold. No vaccine is 100% effective and although you are less likely to get flu after you’ve been vaccinated, there is no guarantee. Should I avoid going to work if I get the flu? If you have the flu it’s likely you won’t be able to get out of bed let alone go to work. It’s specific to individuals so you need to make the decision yourself. You are infectious from day 1 up to about a week, so what I would say is that if you do go to work, make sure you avoid cross contamination – wash your hands frequently and wipe anything you may come into contact with (door handles, telephones, keyboards etc). How do I know if I have the flu and not just a cold? The main symptoms for flu is a high temperature (38C or higher), tiredness/weakness, a headache, general aches and pains and a dry, chesty cough. Many people describe even their skin and fingernails ache! With a cold, your symptoms may include a runny or blocked nose, sneezing and a sore throat. Generally the symptoms, while annoying, they are much less severe than the flu. These are some of the more frequently asked questions I get about having a flu jab. Very few people are unable to have the flu jab, usually down to a serious allergic reaction they’ve had in the past, or people with an egg allergy (some flu jabs are made using eggs). I clearly remember having flu in about 1990 because I was unable to work and was so poorly; that’s a lot of years ago and I have not had flu since and I really do believe this is down to regularly having my annual flu injection. If you have a question about the flu jab, feel free to ask us about it on Twitter @medvivonews – or speak to your GP or local pharmacist. Carole registered as a nurse in 1980 and has worked clinically in community and primary care settings for over 30 years. 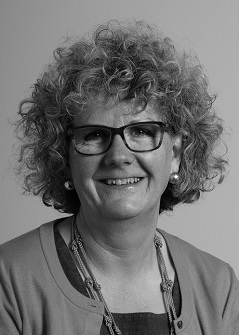 As Director of Nursing at Medvivo, Carole provides professional leadership for nursing, allied health professional and clinical support staff. She supports the continual professional development of nursing and high quality care delivery by a compassionate, highly competent and caring workforce. Carole also helps to provide a continuous learning and development environment where excellent clinical care can flourish.